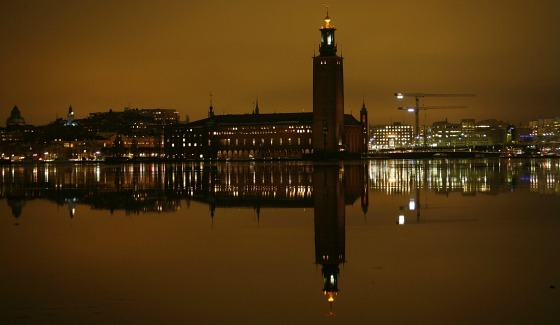 It’s from the tower on this imposing building on the waters edge that you get that terrific view of Stockholm pictured at the top of the page. The building itself is interesting though and is apparently constructed with 8 million bricks! 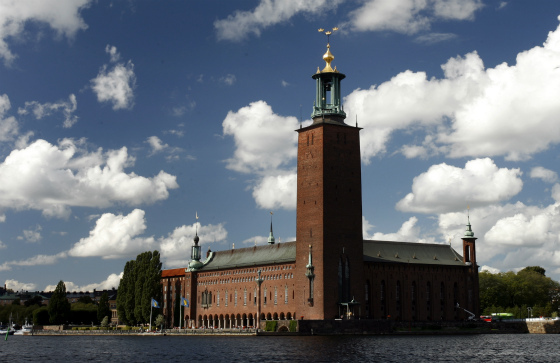 This is still the seat of power in Stockholm and the daily tours will take you to see the areas where council business takes place, like the council chamber but you’ll also see the ceremonial halls – the Blue Hall and the Golden Hall which we found particularly impressive. The mosaics in the Golden Hall are stunning! This is an extract from our free Stockholm City Guide. The Nobel Banquet is held in the Blue Hall (pictured above) on December 10 every year. After your visit, it’s worth taking a walk in the small park (Stadshusparken) between the building and the lake. Here you’ll find sculptures and an impressive view of Gamla Stan. We did this on a really cold winters day and it was beautiful. You can only visit City Hall on the organsied tours which take place hourly through the year. There are more tours in the summer months than in the winter months. Adult admission to the tours varies depending on the season too. From April to October it costs 90 SEK and from November to March it costs 60 SEK (2011 prices). Admission is free with the Stockholm Pass. Admission to the City Hall tower is by separate ticket and is only available from May to September. The tower opens at 9.15am each day and groups are allowed up every 40 minutes. A lift is available half way to the top. You cannot book in advance for a future day as the ticket office only sells same day tickets. The ticket office opens at 9am. Adult ticklets cost 40 SEK (2011 prices). Admission is free with the Stockholm Pass.